Herald Square proper is the north end of the square between West 34th Street and West 35th Street. The old New York Herald Building was located on the square. The square contains a huge mechanical clock whose mechanical structures were constructed in 1895 by the sculptor Antonin Jean Carles. The monument, known as the James Gordon Bennett Monument consists of the Goddess of Wisdom, Minerva with her owls in front of a bell, flanked by two bell ringers mounted on a Milford pink granite pedestal. The monument's bell was designed to chime on the hour. The two seven-foot-tall bronze laborers, nicknamed Stuff and Guff give the appearance of ringing the bell with their mallets, while in actuality is rung by mallets located behind the bell. The figures and the clock were originally part of the 1894 New York Herald Building that was located at the square. Prior to the demolition of the building in 1921, the figures were removed and reinstalled in the Square in 1940. Greeley Square lies between West 32nd Street and West 33rd Street and between Broadway and Sixth Avenue, and is taken up almost entirely by a triangular park. It is named after Horace Greeley, who was the publisher of the New York Tribune, the Herald's rival newspaper. (The two papers later merged to form the New York Herald Tribune.) 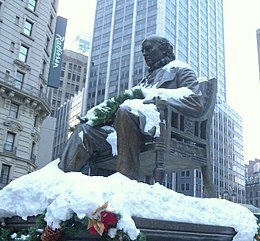 There is a statue of Greeley inside the park, created in 1890 by Alexander Doyle The small park is planted with trees and shrubbery, enclosed by a wrought-iron fence, and provided with inviting chairs, tables and a restaurant kiosk. The area around Herald Square along Broadway and 34th Street is a retail hub. The most notable attraction is the Macy's flagship department store, the largest in the United States (and according to Guinness World Records the largest in the world until being surpassed by a Korean store in 2009). In 2007, Macy's, Inc. moved its corporate headquarters to that store after renaming from Federated. Macy's archrival Gimbels was also located in the neighborhood until 1984; in 1986 the building became the Manhattan Mall. Other past retailers in the area included E.J. Korvette, Stern's, and Abraham & Straus. J.C. Penney opened its first Manhattan flagship store in August 2009 at the former A&S location inside the Manhattan Mall. The square is roughly equidistant between Madison Square to the south, and Times Square to the north. Herald Square's south side borders Koreatown, at West 32nd Street. The area is served by the 34th Street – Herald Square station (B, ​D, ​F, ​M​, N, ​Q, ​R, and ​W trains) of the New York City Subway. Additionally, the 33rd Street station (HOB–33, JSQ–33, and JSQ–33 (via HOB) trains) of the PATH serve the square. Since 1992, Herald and Greeley Squares have been cared for by the 34th Street Partnership, a Business Improvement District (BID) operating over 31 blocks in midtown Manhattan. The 34SP provides sanitary and security services, maintains a horticultural program that includes trees, gardens, and planters, and produces events, product launches, and photo shoots. 34SP also added movable chairs, tables, and umbrellas, to the parks. In 1999, the parks were completely renovated by 34SP. Since 2008, each park has had a food kiosk operated by 'wichcraft, the highly regarded sandwich, soup and salad purveyor owned by Tom Colicchio of "Top Chef" fame. In 2009, 34SP converted the parks' Automated Pay Toilets into free public facilities, a rarity in New York City. With the introduction of "Broadway Boulevard", a 2009 project by the New York City Department of Transportation to increase pedestrian space on the segment of Broadway between 35th and 42nd Streets, the passive space provided by Herald and Greeley Squares more than doubled, radically changing the character of the area. The two blocks of Broadway between 33rd and 35th Streets were completely closed to vehicular traffic, and are pedestrian-only. The parks' operators, 34SP, filled the newly pedestrianized space with chairs, tables, umbrellas, and free public programs such as chess tables, dance lessons, and exercise classes. As of April 2013, the boulevard is being redesigned. The George M. Cohan 1904 song Give My Regards to Broadway includes the lyrics "remember me to Herald Square". Andrew B. 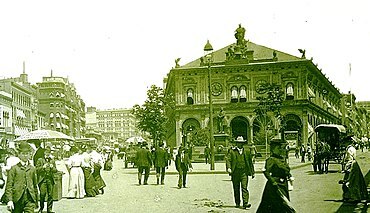 Sterling and Harry Von Tilzer's 1907 "Take Me Back to New York Town" refers to Herald Square, as does Billy Joel's 1978 song "Rosalinda's Eyes". Freedy Johnston's song "Bad Reputation" refers to Herald Square as well. Herald Square is also the terminus for the Macy's Thanksgiving Day Parade, broadcast nationally by NBC-TV. ^ a b c White, Norval & Willensky, Elliot (2000), AIA Guide to New York City (4th ed. ), New York: Three Rivers Press, ISBN 978-0-8129-3107-5 p. 225. ^ Kenneth T. Jackson: The Encyclopedia of New York City: The New York Historical Society; Yale University Press; 1995. P. 140. ^ Henry Moscow: The Street Book; Fordham University Press 1978. P. 60. ^ Lueck, Thomas J. "Fortune's Smile Glimmers on Herald Sq. ", The New York Times, September 10, 1989. Accessed October 20, 2007. "Although Macy's survived and has prospered as the Herald Square landmark, Ohrbach's, Korvettes and Gimbels had closed by 1984.... The 260,000-square-foot (24,000 m2) Herald Center, which opened in 1986 as the city's largest vertical mall, has so far shown little prospect of success." 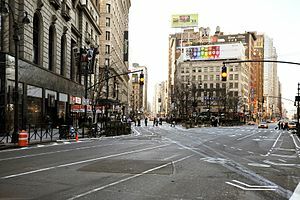 Wikimedia Commons has media related to Herald Square and Greeley Square.